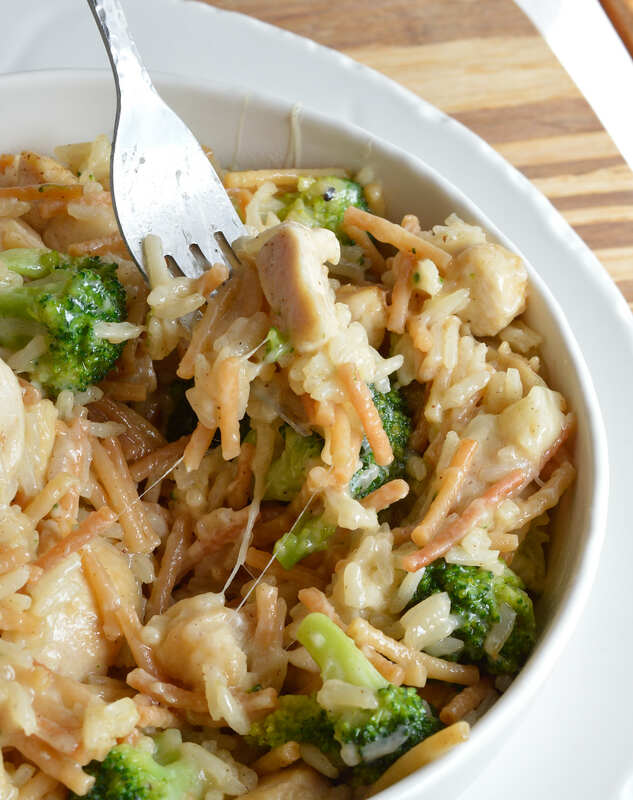 Make a weeknight dinner recipe that is quick, easy and sure to please the entire family! 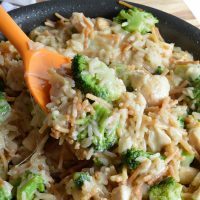 This One Pot Cheesy Chicken Broccoli Rice Casserole has everything you need in a meal in 30 minutes or less! I am proud to be partnering with Horizon Organic to bring you this tasty recipe! As always, all opinions are 100% my own. 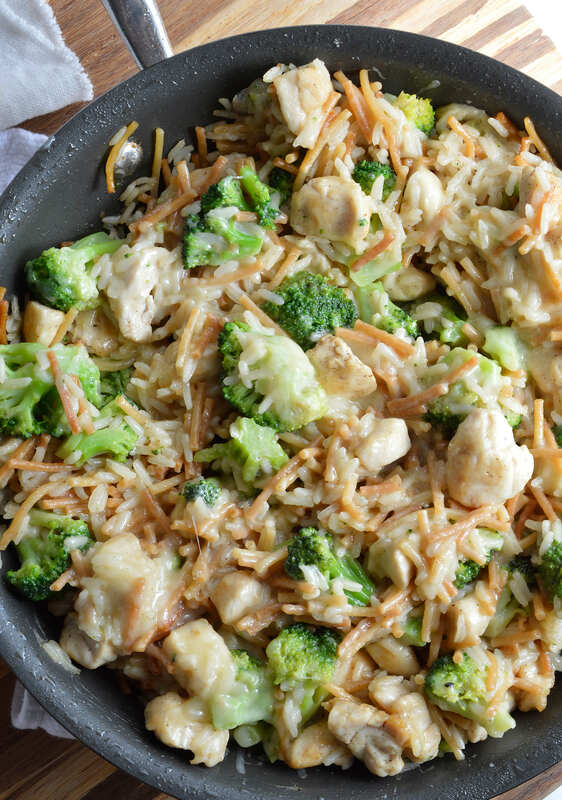 Okay y’all, this One Pot Cheesy Chicken Broccoli Rice Casserole is the ultimate weeknight dinner recipe! One pot means less dishes, that’s a bonus obviously (I want to wash more dishes, said No One Ever!). 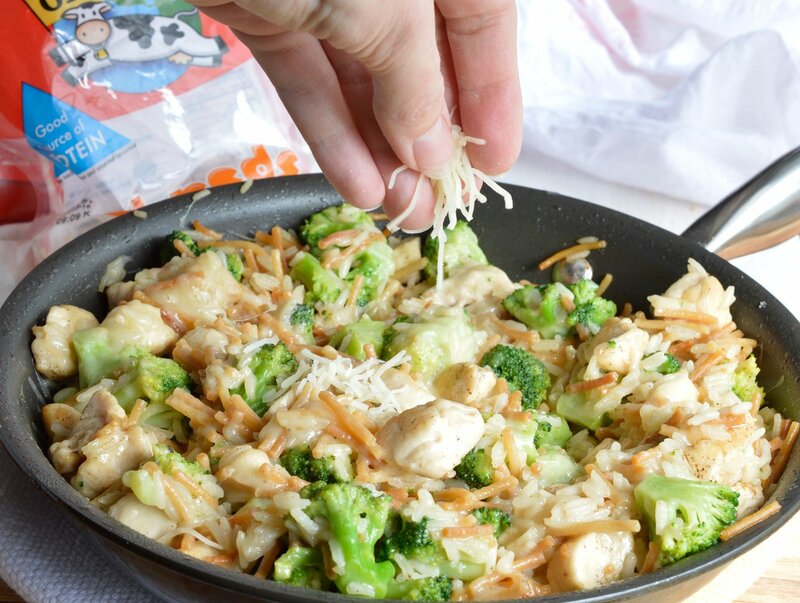 Cheese, chicken, broccoli and rice were meant to be together. And, I added pasta just to cover all my bases. If you have one kid that likes rice and one that likes pasta . . . here you go kids, eat up! This is a homemade meal that you can feel good about serving to your family. 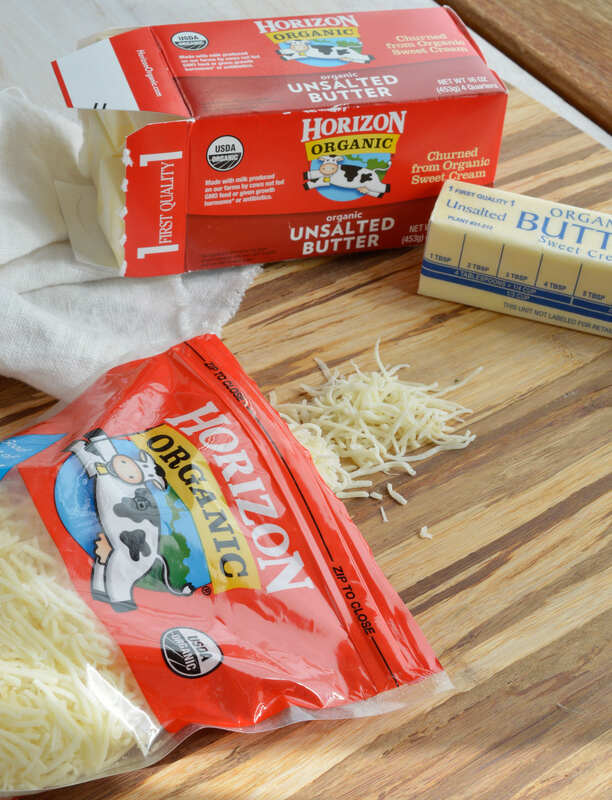 It starts with quality ingredients like Horizon Organic Unsalted Butter and ends with Horizon Organic Shreds. I have always been a fan of the Horizon Organic product line but they officially won me over for life with their Horizon Organic Lactose Free Vitamin D Milk! My daughter cannot drink lactose milk and now I am able to give her organic whole milk thanks to Horizon. Sign Up For The Horizon Newsletter or Check Them Out On Social Media: Horizon on Facebook, Horizon on Twitter, Horizon on Instagram, Horizon on Pinterest. This is going to be one of your new favorite dinners. I have an upcoming post for a fellow bloggers new cookbook and it inspired my obsession with rice pilaf. Seriously, my daughter and I are pilaf obsessed! A weird obsession, but nevertheless completely warranted. I turned that delicious side dish into this awesome family meal! 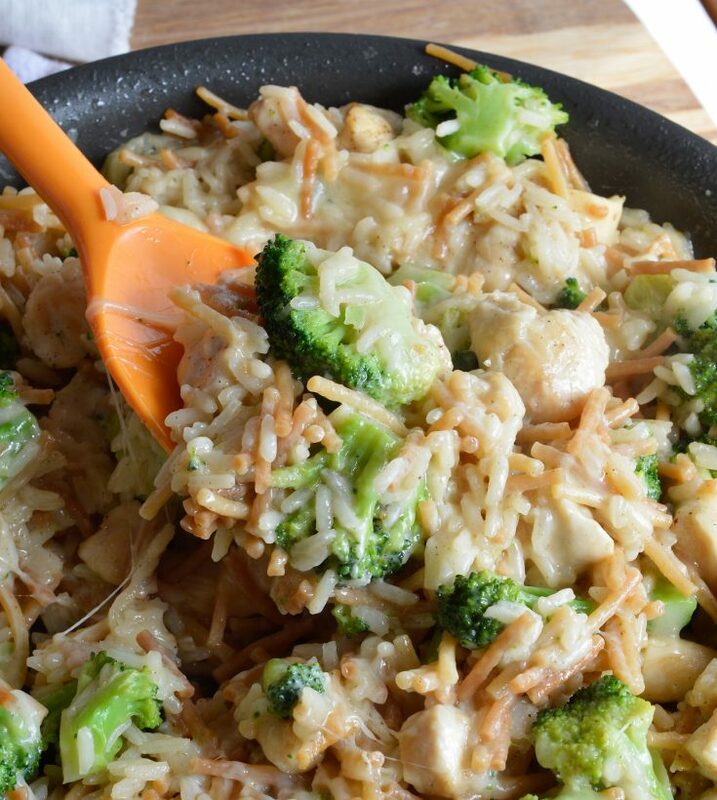 The Chicken Broccoli Rice Casserole is good on it’s own but it is the cheese that makes this dinner spectacular. Pretty much any dinner could use a little extra cheese in my opinion. 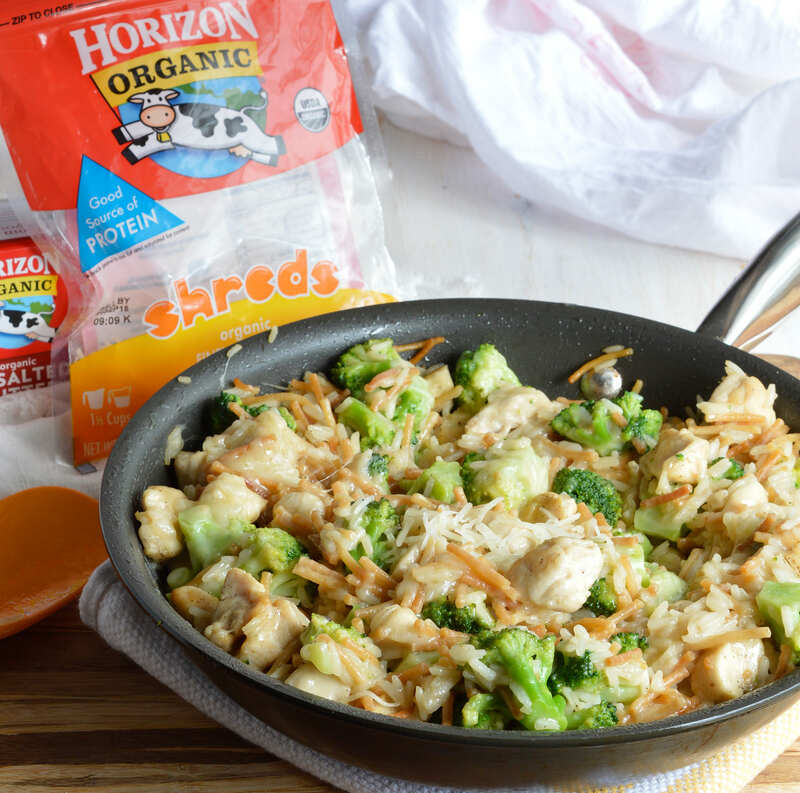 The Horizon Organic Shreds help to get this meal on the table in no time. Who has the time to shred cheese!?!?! Another time saver is the frozen broccoli florets. I use a lot of frozen vegetables in my cooking to save time. And don’t we all need to save a little time while still eating homemade family meals? Yep. Make a weeknight dinner recipe that is quick, easy and sure to please the entire family! This One Pot Cheesy Chicken Broccoli Rice Casserole has everything you need in a meal all in one. Over medium/high heat in large pan; cook chicken with frying oil, salt and pepper until browned and cooked through. Remove from pan and set aside. Reduce heat to medium and allow pan to cool for 1 minute. Melt butter in pan and stir in pasta. Continue to stir and fry pasta in butter until golden brown. Add rice and toast for 20-30 seconds. Add stock and garlic powder. Bring to a boil, reduce heat to medium/low, cover and cook for 8 minutes (stir occasionally). Add cooked chicken and cheese. Just a little more cheese.